Twitter is HUGELY important for any artist to work with. It is, however, a traffic driver rather than a destination. So make sure you have your gallery set up first in a public place like Flickr. Once you have that gallery set up, it’s time to use Twitter’s power to drive visitors in. Twitter is free and easy to set up. Just go to Twitter.com and create an account. Don’t worry too much about the banner image or profile square when you first get started. Put in something, but you can always change it later. The key with Twitter is just to get started. It’s a system where you can grow phenomenally quickly. I also recommend setting up an account with TweetDeck.com. This will help you manage Twitter far more easily. Once you have those two accounts set, it’s time to begin! * Think short and sweet. You have 140 characters. Make sure several of those are hashtags with powerful wide-reaching terms. * include an image. Posts with images are FAR more likely to get seen and clicked on. Some Tweeters feel an image is mandatory for a successful post. Aim to post at least once a day. Keep in mind that people rarely “look back in time” to find posts. They mostly glance at their phone when they have a free moment to see what’s going on *right then*. If your post was made two days ago, they probably won’t see it. So frequent posts gives you a better chance of being seen. It’s extremely easy to build up a large follower list. Here’s how to do it. Go to the BVAA Twitter Feed. Click to see our followers – these are the people actively interested in learning about art. Note that a portion of these followers are going to be salespeople and webcam models. This is a part of twitter. Just ignore those. Scroll through and follow all legitimate art and author related people. These people followed the BVAA so we know their accounts are active. They’re very likely to follow you, too. Click to follow maybe 100-200 people. It should only take a few minutes. Then the next day do that again. They’re likely to follow you back fairly quickly, so your followers number should rise quite high very quickly. This is good, of course! It means more people will see and retweet (share) your posts. But it also means that looking at your standard timeline starts to be like drinking from a firehose. As you get 1000 and 2000 followers the flood of tweets coming through will be quite staggering. This is where lists come in! Once you are following over 1000 people it becomes fairly challenging to actually read your timeline. So what you do is use lists and hashtags to get ideas of what to retweet. Look at the BVAA Twitter Feed. 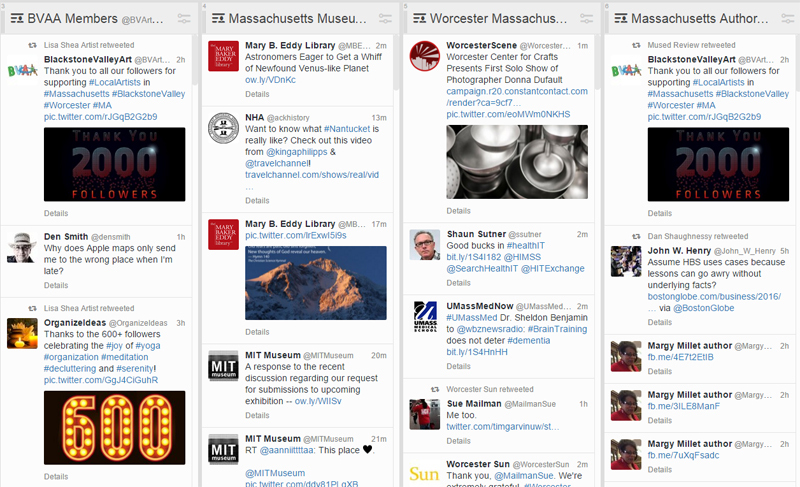 We have two lists set up there – one of BVAA members and one of Massachusetts museums. You can subscribe to both of them. That means you have instant access to all tweets made by members of those lists, in an organized fashion. Now you set up columns in TweetDeck to watch those lists. It means, at a glance, you can see new posts in those lists. You don’t have to go hunting for the details. It’s just right there. Every once in a while click on the browser window and see what’s happening. If something looks interesting, hit the “like” or “retweet” icon to show your support. The more you do that, the more others are likely to like and retweet you in return. You can subscribe to other peoples’ lists or make your own. When you make your own lists you can have them be public, if you think others might benefit from seeing them. Or if it’s just for your own benefit you can make them private. While we’re looking at those lists – look at the three posts in the bottom right. See how they seem completely meaningless? This is what happens if you use an automated Facebook tool to simply retweet what you post on Facebook. Who would ever click on those links, having no idea what they were about? That is why it’s important to posts right on Twitter with your message and image. If you just let Facebook (or another third party site) post a jumbled up URL, it’s likely nobody will click on it or follow you. In addition to following lists, you can follow hashstags. So you can set up a column to show everyone who used the #cyanotype hashtag, or #BlackAndWhite hashtag, or whatever you want. That gives you instant access to interesting posts about topics you care about. Hashtags are in essence keywords indicated by starting with a # sign. In addition to using hashtags in your tweets you can also mention specific peoples’ names. This gives them a heads up about the post. It makes it more likely they’ll see the post. You do that by putting an @ sign before their account name. There are three ways this works. They are the focused message, the generic mention, and the dot-mention. If you post a message with the person’s name up front, it’s assumed this is a fairly private conversation between you and that person. The only people who will see the message are people who follow you both. So someone who only follows you (and not the recipient) won’t see that post. Simply by moving the mention out of that lead spot the tweet is now seen by the world. Another option is to put a dot in front of the username. You only need to do this if the name is in that very first spot – and really, it’s doing the same thing as above. It’s ensuring the @ isn’t the very first character and therefore avoiding the rule that a tweet that starts with an @-mention is private. So those are the three ways to mention people in tweets. You won’t need to worry about this for a little while, but it’s good to keep this in mind. At some point you will be following 5000 people. It’ll happen sooner than you think. Once you reach this point, Twitter will put on a block which is meant to curb spammers. You won’t be able to follow any more people until you have adequate people following YOU. This is why it’s important not to just follow random people the entire time. If you followed 5000 people who never followed you back, you’d be completely stuck. You couldn’t follow anyone else. You need to follow people who are likely to follow you. Sure, there might be a few big art organizations who you follow even though they don’t follow anyone at all. That’s ok. But in general you should follow people who are likely to reciprocate. And, for the same reason, you should scan your own follower list every few days and follow every legitimate person who is following you. You can ignore the “buy more twitter follower” salespeople. You can even block the “adult webcam model” accounts. But in general you need followers to balance out against the people you want to follow. For this reason I tend to leave the sales accounts in my follower list, and just not follow them back. I do block the adult webcam models. That balance gives me an ample pile of followers to then offset the people I want to follow. If you end up with someone in your follower list who tweets every five seconds, “mute” them rather than block them. While blocking will remove them as a follower, mute simply silences them while retaining them as a follower. That way you maintain that follower-to-followee balance. If you do hit the point where you are following 5000 people but only have say 2000 following you, there’s a tool to help you get that into balance. Go to FollowerFilter.com and let it view your Twitter account. It’ll show you all your followers in a great, organized fashion. For example, with the BVArtAssoc account right now it reports we have 5002 people we’re following. Of those, about 2500 of them are NOT following us back. These are called “Unfollowers.” We can then sort that unfollowers list based on when the accounts last made a tweet. If someone hasn’t made a tweet in the past five years, and they’re not following us, it’s time to drop them from our list. There’s no sense following someone who hasn’t tweeted for years and who isn’t following us either. The more we prune off those dead accounts, the more space we free up to follow people who are active. This can be a little confusing at first, so don’t worry about it quite yet. When you start to reach that 5000 limit come back and re-read this, and it’ll probably make more sense. If you have any questions, contact Lisa and she can send you a free step by step ebook on Twitter. Here are the BVAA members who are on Twitter. Please follow and support these members. If you’re not on this list yet, let us know and we’ll get you on here!